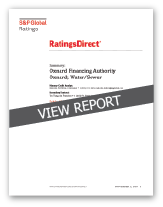 S&P Global Ratings stressed that “the [Oxnard] wastewater system’s financial performance improved significantly in fiscal year 2017.” The Oxnard City Council approved a five-year wastewater rate package in spring of 2017. The first rate adjustment went into effect on July 1, 2017. A second rate adjustment became effective January 1, 2018. S&P Global ratings anticipates that the City’s financial performance going forward will likely remain strong in the near term. For more information contact Jesús Nava, Assistant City Manager at (805)385-7430.